Vice-president Biden says there is “no doubt” who is responsible for the chemical weapons attack in Syria. I have doubts. Doubts a plenty. I think Mr. Obama must, too, if it’s taken us this long to act in Syria. Doubt made heavy by our collective memory of adventurism in Iraq. I’m forced to doubt that our military machine can actually achieve human progress at the cost of human lives. I doubt that in a situation as muddled and confusing as Syria is today that we can be confident of who fired what at who. After all, Bashar had everything to lose and the rebels had everything to gain through his use of chemical weapons. Yes, it sounds like a Bond villain move–launch a chemical attack on civilians to frame the government you want to overthrow. It’s something out of a bad Tom Clancy novel, but then Tom Clancy novels pretty much predicted 9/11, so you never know. There is always doubt. Yes, we should doubt whether sitting by and watching 100,000 die in Syria was the best move as surely as we should doubt that launching missiles against its regime is the right move now. There must always be doubt, Mr. Vice President. We live in the dusky afternoon–always. There are no precise times. No sharp times. That was the previous administration’s illusion: a world of good vs. evil. Barry–whose real name isn’t “Barry,” but is actually “Ralphie,” though one has to wonder just who would pick “Barry” over “Ralphie”–leans out the drive-thru window down at the face staring sullenly forward at the chip in the blue vinyl of his own steering wheel. Ah, here it is at last…the last great hope for summer sci-fi. Elysium comes to us from Neil Blomkamp, the man who would’ve directed the Halo movie and who instead gave us a sorta-allegory for apartheid with District 9. Once again, he’s produced a science fiction film with a backdrop rife with potential to comment on our world. 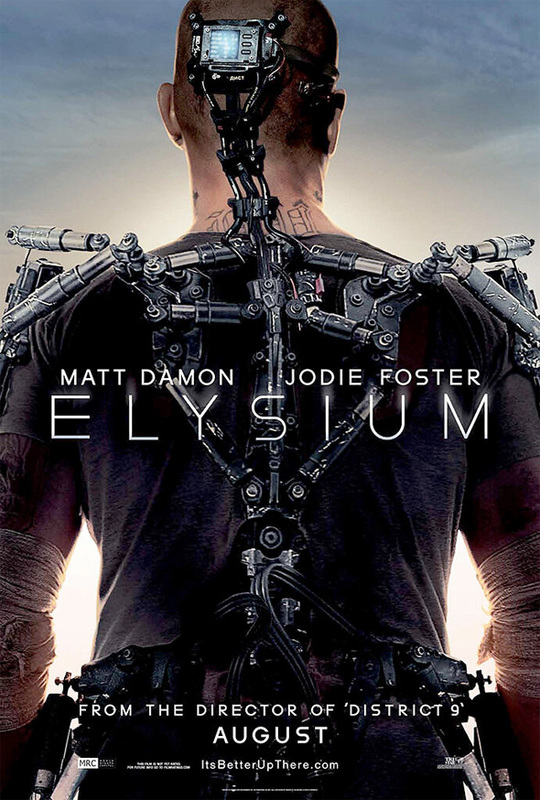 Okay, so the premise of Elysium is that the rich got the heck out of town, built a big space station torus in orbit and then left the rest of Homo sapiens down on a really, really brown Earth. Best of luck down there, suckas! Except that I guess the elites up on the space wheel are still dependent on Earth for resources–most visibly in the film, for a supply of fresh robot helpers. The gap between rich and poor has never been wider than in the 2154 of the film (and boy howdy is that saying something). Earth looks pretty much like a land fill in Mexico (because that’s where it was filmed) while Elysium has nearly magical medical booths that cure leukemia or rebuild your whole freakin’ face in, like, seconds. Blomkamp focuses most on this disparity in access to medicine as it’s the starkest and most clearly unjust dimension of the divide between rich and poor. However, the movie doesn’t go much further than that in commenting on society’s great divide. In fact, once Matt Damon has a robo-exo-skeleton thing bolted on to him, the movie becomes a pretty much straight-up action farce. Damon and his criminal/freedom fighter buddies just happen to choose to abduct the one billionaire on the planet who has the codes to override Elysium’s computers (on the one day he was planning a coup with a deliciously sinister Jodie Foster)–which is apparently enough to completely take over their political system, too. Go figure. A bunch of robo-fist fights later, Damon does the noble thing and lets the data tucked into his brain be ripped out, saving “everyone.” Elysium’s robot helpers are tricked into thinking every last human being is a “citizen” and they begin delivering aid back to the surface. Yeah, except, a few medical shuttles whizzing down to Earth on auto-pilot does not a societal injustice right. And such a Deus Ex Machina resolution doesn’t really give us anything to think about when it comes to wealth inequality or immigration reform. There is no magic button we can push to cure our ills. At least with District 9, we could nod to ourselves after the bloodbath/gross-out bits when we learned, symbolically, that the other is us and we are the other. Is clinging to power and privilege ultimately more exhausting than anything else? We’re never sure, because whatever promise that moment had was, like the rest of Elysium’s potential, wasted. One day in 2007, journalist Namir Noor-Eldeen was walking down the street, camera bag slung over his shoulder. The street was in Baghdad. He would die on that street. Noor-Eldeen may have only had the faintest glimmer of awareness that his life was ending when an Apache helicopter opened fire with its machine guns and killed him, along with his assistant and several other men. But for three years, the world and the American people did not know the circumstances of his death either–not until a young private named Bradley Manning leaked the video recorded from the nose of that helicopter, along with numerous other documents that detailed American cover-ups in Iraq. Manning has since stood trial and now awaits sentencing for the crimes he admits committing by leaking classified documents while still enlisted in the United State Army. He apologized to the court, saying that he should have pursued other channels to right the wrongs he had become aware of. No, Bradley. You were right the first time. Transparency is our greatest weapon against injustice. The Founders of this republic knew it, and that’s why public trials were codified in our justice system. Secrets are the enemy of democracy, and the secrets our military was keeping made all of us culpable for crimes in Iraq and elsewhere. The death of Noor-Eldeen should have led immediately to review of military practice when authorizing targets in a populated area, but instead it was covered up for three years. We can not expiate the sins we do not know about. Manning’s fate, no matter what the court decides, will be complicated. He has now identified himself as transgender and credited some of the emotional turmoil he has felt because of “his problem” for motivating his actions. By contrast, Edward Snowden–who leaked details of the NSA’s pervasive abuse of its authority to spy on Americans and others, particularly through the Internet–fled the United States instead of facing trial as Bradley did. Like Manning, it took courage. He, too, faces an uncertain future. These two very different young men, both now martyrs and heroes to progressives who have railed for years against the post-9/11 excesses of the United States government and military, have now each made their small mark on history. We cannot know for some time what impact their actions will have on the course of American imperialism or on transparency and justice in the Information Age. History makes and remakes those judgements as it marches forward, so we will have to wait and see. What, though, do their peculiar sacrifices say for the role of the individual in history? Each of them was very conscious that he was stepping out of obscurity and into the river that shapes the landscape–vying to make a difference, to change the course of things. The nineteenth century thinker Thomas Carlyle has been thoroughly harangued by critics for arguing that “history is…but the biography of great men.” Many have said his theory was unduly celebrating historical figures as “heroes” in a story that was really written by larger social forces, by historical inevitabilities. But when we look at the story of America since 9/11, it is hard to see what has happened without considering the impact of the individuals who were on stage for this tragic melodrama of war without end. Yes, foreign policies and cultural tension created a hotbed of anti-American sentiment throughout the Muslim world, but without a charismatic Saudi named Bin Laden, would there have ever been a strike so powerful that it would alter America’s relationship with the world as fundamentally as 9/11? If Gore had won, or if McCain had earned the top spot on the GOP ticket in 2000, would there have ever been a war in Iraq for Manning to expose? Bush was a consequential president. He mattered as an individual. He changed history. Bin Laden. Cheney. Bush. Hussein. And now Manning and Snowden. Whatever else this chapter of history teaches us–or will teach us when the ink is finally dry–I cannot help but think it redeems Carlyle. Most of us in the U.S. have been content to live out our generally comfortable lives and watch the “great men” of history wage their wars and draw their lines on the map. Maybe we complained. Maybe we marched. But Snowden and Manning did more. They tied their fates to a cause, chained themselves to it like an anchor and faced the consequences. Many try to label Snowden and Manning as traitors, but if we look at the story honestly, we have to see them for what they are–the heroes. They risked, with nothing to gain, everything that was safe and comfortable for one cause, and one cause only: Truth. After finishing assembly of my fourth pre-fab bar stool while helping move my niece into her new apartment, I plopped down on the nice, big cushy red couch provided by one of her roommates for a quick rest. A black slate screen stared back at me from the other side of the room. Instead of clicking it on, I fished out my phone and read a few pages off CNN.com. I thanked her and told her I was fine–just catching my breath before the delivery truck arrived with the new bed. She smiled and went about her own move-in business. I’d known this about my niece’s television. She had told me on our way into town in my overloaded van that she and her roommates were going to save money by only connecting Internet, with no cable television subscription. In fact, that’s why I hadn’t bothered to even consider flipping it on. There wasn’t anything in particular that I wanted to watch, so I’d just left it off. I’ve heard a lot about folks doing this–TV without TV. This growing trend has been touted mostly in the popular press as a cost-saving measure, a way to escape the screw-you monopolistic pricing schemes of the big cable companies. 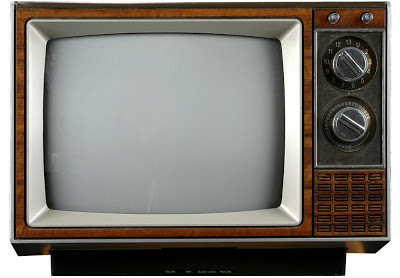 But at that moment in the soft embrace of the big red couch, I realized there’s much more to this shift in television viewing, a shift that may presage the future of TV in general. When you ditch the cable box and its 999 channels, you can still find just as much entertainment through Hulu and Netflix and other streaming video sources. But you must find it. You must choose. The passivity that has characterized television viewing since the beginning is completely undone when you go Internet-only. The empowerment that began with TiVo and other DVRs becomes outright liberation–with all of its endemic responsibilities.